When you have unwanted water in your home or business you need to know what to do NOW. The difference in waiting just a few hours before you take action, can mean hundreds, even thousands of dollars worth on additional damage to your home and belongings. Safety First. Turn off all power to rooms that are affected. Walk carefully on wet surfaces especially when moving from carpeted areas onto hard surfaces. If there are any sagging ceilings, do not walk under them. They may collapse and cause injury. You may want to punch a small hole in them and let them drain into a plastic bucket in order to relieve the pressure the water is creating. Do not turn any overhead lights if ceiling is wet. Do not operate TV’s or other electrical appliances while standing on wet carpets or floors. Especially on wet concrete floors. 1. Find And Stop The Source. 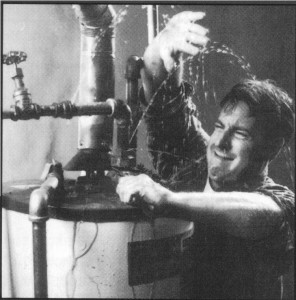 If fresh water plumbing is involved turn off the valve to the fixture that is leaking. If there is no cut-off valve or you cannot locate the break, then turn off the main water supply valve to the house. If you cannot find the one in your home, you should cut off the outside water main. If you cannot do this, then call a plumber or qualified tradesman. Sometimes the fire department can help. 2. If the water source was clean, remove as much standing water as possible. Use a UL approved wet/dry vac if you have one. Do not use a household vacuum cleaner that is not approved for this use. Use clean, white towels, linens, blankets, bedspreads, to contain the water and prevent it from entering unaffected areas. Do not attempt this if the water is contaminated as from a sewer source, leave this to a professional company. 3. Locate and remove from the affected areas all clothing, books, shoes, paper goods, and any other items that may be damaged by water and place them in an unaffected area. Move light furniture to an unaffected area and if able, place aluminum foil or plastic under the legs of furniture that is remaining in the affected areas. If the piece of furniture is solid at its base, put wooden blocks or Styrofoam under it to prevent bleeding or rusting on to the flooring material. Wipe any water from the legs or where it has been splashed up on any furniture. Place any curtains in areas that are wet on pant hangers and hook on the curtain rod so they are off of the floor. 4. Remove valuable paintings and pictures from any wet walls. In warmer months, turn on air conditioner no lower than 72 degrees. Open drawers on any wet furniture and remove contents and spread out to dry. Prop up wet upholstery cushions on a clean white sheet. Remove any area rugs, to a dry area. Be careful as these might bleed on to other surfaces. 5. Call a competent, water damage restoration contractor to do a controlled ‘dry down’. Don’t wait. A professional firm understands the critical nature of a water damage loss and should be willing to respond quickly, even after business hours and on weekends. 1. Clean Water. This is simply drinkable water, at least when it left the pipes. It has no harsh or harmful chemicals that might pose an immediate danger to the health of inhabitants that might come into contact with it. Again, keep in mind that this water could have passed through some materials that may leach some harmful elements into it. Or, as time passes, bacteria could build up in it causing it to deteriorate into a more dangerous type. But for the sake of this brief report we will leave it with this definition; Water that has come from a clean and potable source and has not been contaminated. This water may come from a burst pipe or a supply hose to a washing machine or dishwasher. Obviously this is the safest type of water to remove and poses the least amount of health hazards. 2. Gray Water. This type of water is unsanitary and contains a degree of contamination that would cause someone substantial discomfort or sickness if consumed. It contains harmful microorganisms or nutrients for microorganisms. Examples of this would be the discharge from dishwashers, washing machines, broken aquariums, water from punctured water beds and the like. This water is dangerous to your family’s health and should be addressed by a trained professional. Allowing several hours or days to pass before this type of water is addressed will cause this type of water to progress to the next category. 3. Black Water. This water is grossly contaminated and always contains pathogenic or very harmful elements. Examples of this type of water are, sewer back up, seawater, ground surface water, rising water from streams or rivers. Black water can contain harmful chemicals, pesticides or medical wastes. Do not attempt to handle this type of water or stay in contact with it. Do not attempt any emergency measures yourself that will cause you or your loved ones to come in contact with this very dangerous water. Immediately call a competent, professional water damage restoration firm that is properly trained and has the right equipment to safely and effectively restore your home. We trust that this brief explanation has helped you to see the importance of knowing the type of water that is in your home and what precautions you should take if you have gray or black water present. Most water damage losses are covered by home owners insurance policies. But there are exclusions. The best time to check to see what is and is not covered by your insurance policy is before you have a problem. You should get your policy out and read it when you receive it. Then if you have a question, you should ask the agent you purchased it from for an explanation. The majority of home owner policies cover water damage if it is from an inside source. Many policies exclude ‘rising water’ or flooding, a separate flood insurance policy is needed to cover this type of loss. Some policies exclude water coming from a failure from a sump pump, although you may be able to purchase a special coverage ‘rider’ that will pay for this situation. Some policies do not pay for a sewer back up that is caused by an obstruction in the pipe outside of the home or if the sewer backs up due to a problem with the city or other sanitary service provider. See your policy for exclusions of this type. Almost all residential insurance policies have what is called a deductible or co-pay. This is where you will pay a preset amount of money to correct or repair the covered loss before the insurance company will begin to pay. This amount may be as little as $100, but can be $250, $500, or even $1,000 or more. The vast majority of policies, however, are from $250 to $500 in the deductible amount. And although most policies will cover the damage caused by unwanted water that is released in your home, they rarely cover the repair of the item that caused it. It is also important to know that most insurance policies have a clause in them that requires the owner of the policy to use their best efforts to ‘preserve and protect the structure and contents from further damage’. This means that the insurance company wants you to do what you reasonably can to keep the damage from spreading or getting worse. This would include attempting to shut off the water if that is possible, removing what items that you can to prevent them from being ruined, and of course, calling a professional company, if it is prudent to do so. Reputable, knowledgeable water damage restoration firms are not insurance representatives and cannot interpret your policy, but they can help you to meet your obligation to ‘preserve and protect’ your home and contents from further damage. If the job qualifies, they will work with your insurance company on payment terms. You, of course, will have to pay the deductible when the technician arrives and sign some paper work that authorizes the restoration company to do the emergency work. Remember, your insurance company wants and expects you to take reasonable efforts to keep the situation from getting worse, even if you can’t get a hold of someone from your insurance firm. This includes arranging for a qualified firm that specializes in water damage restoration to come out and assist you in your emergency protection efforts. When you experience a water damage loss you need the most qualified firm to put you back to normal as fast as possible and with the least disruption in your life. Unfortunately, not all companies that clean carpet and even advertise that they handle water damage are qualified to dry down your wet home and contents. To handle water damage properly, it requires the company and it?s technicians to be appropriately trained in the science of drying. The firm also should have the required monitoring instruments that can detect the presence of moisture even behind walls and under floors. Only after adequate testing with these sensitive instruments can you be sure that your home is thoroughly dried out and safe from potential build up of mold, mildew, and other microorganisms. 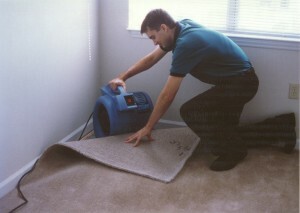 A professional water damage restoration firm will have special air movers that direct large volumes of air along the floors, walls and carpets to speed up the drying time. They will also have commercial dehumidifiers that may be needed when conditions in the home are humid and drying the air becomes important. Before choosing a firm to assist you with drying down your home, ask what industry certifications the firm and its technicians have. One excellent certification comes from a non-profit certifying body in the cleaning industry called The Institute of Inspection, Cleaning and Restoration Certification or IICRC for short. Someone in the company you select should be certified as a Water Damage Restoration Technician. Ask them what testing and monitoring equipment they have and if they plan to use air movers and commercial dehumidifiers. You deserve a qualified, professional company to return your home to the condition it was in prior to the loss, don’t settle for less.